I got a note in my email that sent back memories of sharpened Mongols #2, mind numbing fear and excitement, eyeglasses, Zesto snacks and hundreds upon hundreds of nerds all in one place. Yep, the Philippine Science High School (PSHS or Pisay) is now accepting applications for Scholars for SY 2010-2011. PSHS Admission Exams will be on November 7, 2009. On their website, it says: "The one-time screening is composed of scholastic aptitude test (SAT) which is designed to measure Scientific Ability, Quantitative Ability, Abstract Reasoning and Verbal Aptitude." During our time (lol, "our time" like it was more than 10 years ago... holy sh*t, it IS more than 10 years ago!) we had to take 2 exams. I remember there were 7 of us who took the first screening, 7 because you had to be in the top 10% of your graduating class to be able to take the exam at all. Three or four of us passed the first screening. A few months later, the results came out just in time to celebrate it with my graduation. I remember it like it was yesterday, my dad went by Pisay on Agham Rd. to check the boards where they put the names up of those who passed (it was 1995, ok! they don't post it on the internet yet! ...or was there internet at all?). When he got back, I saw him park the car, he got out and walked towards me with his Po-po-po-poker face (po-po-poker face, nananana!) and then whispered in my ear, "Pumasa ka." (You passed). My mind went blank at that moment, I started shouting and jumping and laughing hysterically. LMAO! It is a great memory indeed. Now, for those who want to take the PSHS National Competitive Exams, fill up the application form linked HERE and submit to your respective campuses. Deadline for filing of application is on August 31, 2009. 2. Bring snacks, but don't eat or drink if you are not hungry or thirsty. Mind your diet. 3. Hehe, OK those first 2 are jokes. Seriously, just study hard, and do your best. PSHS is a great school with challenges and opportunities to hone your skills and sharpen your mind. Come to the exams prepared. And you are fortunate enough to get through, be prepared for one heck of an education. Hehe! 1. 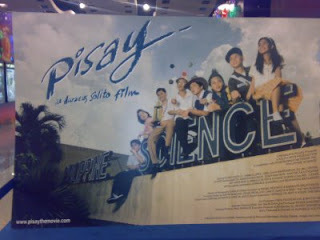 Photo of the poster for the movie "Pisay" by alumnus Aureaus Solito. 2. 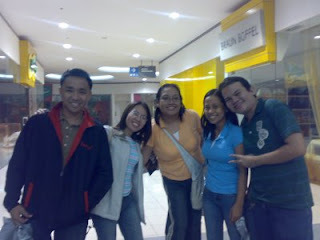 Some of my Pisay batchmates who also watched the movie. Well, goodluck sa mga magtatake ng exam :)) Hahaha. Ang sweet naman ng style ng pagkakasabi ng father mo na pumasa ka. ROFL. hahaha. Hehehe Sweet ba? I guess it didn't matter HOW he said it, I was laughing and cheering - almost rolling on the ground with glee. hehe.